She was the designer who made accessories fun, turning Mulberry from a straight-faced heritage brand into one of LFW’s hottest tickets – with presentations featuring giant glittery panthers, spiders, bags covered in badges and quirky details galore. And now Emma Hill has done it again. She officially unveiled her debut collection for her brand-new label, Hill and Friends, today in an intimate (and we mean intimate – we were sitting this close to Anna Wintour) sit-down breakfast at Claridges. The Claridges sign was replaced with a Hill and Friends sign for the day. And forget po-faced cappuccinos and artisan croissants. Oh no. This was breakfast on a – very pink – sugar high. With smiley faces and googly eyes. Oh, and mini Shetland ponies. “I love to tell a story around a collection, invite the audience into our imagination and let them share the fun!” Hill said. Well, she wasn’t kidding. Outside the entrance: Neon-pink flowers arranged into Sesame Street-worthy furry monsters – complete with googly eyes. 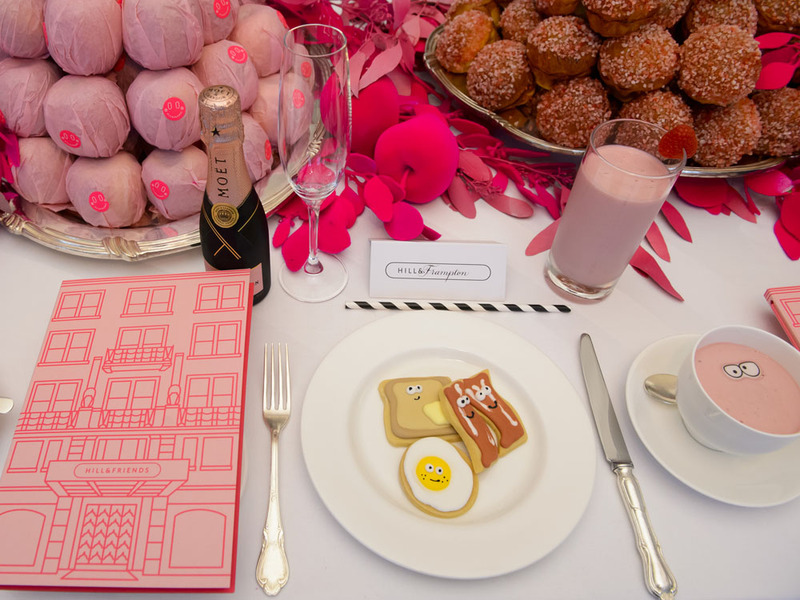 On the menu for breakfast: Happy breakfast biscuits – that’s biscuits in the shape of bacon and fried eggs to you and me Hard-boiled eggs – with dyed fuchsia pink shells, naturally Pink breakfast yoghurt with edible eyes served in a breakfast teacup Mini bottles of pink Moet champagne Pink milk in mini milk bottles. Yup folks, are you sensing a theme? We’re definitely Thinking (neon) Pink, is the new house’s signature colour. Bellboys dressed in dark pink uniform, complete with neon pink piping and ‘Hill and Friends’ caps, carrying Hill’s new bags in on ornate trays and stepping smartly round the room before disappearing off into a pink-walled exit. The bags: The collection comes in six key silhouettes: The Happy Handbag, Happy Satchel, Happy Shoulder Bag, Happy Chain Bag, Happy Mini Bag and Happy Clutch. The colour palette runs from black, caramel, navy and leopard to shots of springy lilac, pale pink and bright green. The kind of chunky, oversized hardware for which we know and love Ms Hill is also present and correct – padlocks and twist locks with smiley Hill and Friends faces. A star turn from two miniature ponies, both festooned with pink rosettes – I mean, what else? Shortly followed by Hill’s adorable little boy, Hudson, smiling cheekily out from a large old-fashioned Claridges luggage trolley. And the best bit? You can literally swipe a bag straight off the Claridges tray – a capsule collection of two styles in six different finishes are available to buy immediately at www.hillandfriends.com and www.net-a-porter.com. Now that’s what we call an LFW debut.